"Margo Hennebach wastes no time," says SingOut! magazine. She "immediately captures your attention and demonstrates an amazing amount of creativity." With her wide-ranging vocals, award-winning songwriting and commanding presence at the piano and guitar, Margo Hennebach takes music beyond mere performance. One reviewer called her concert "one of the finest performances it's been my privilege to experience." Singing with passionate, disarming openness, she "embodies the best qualities of the singer-songwriter scene: she scales down her compositions to allow intimacy but with enough pop smarts to keep you hooked." Originally part of the Hoboken music scene, and now living near Hartford, CT, Kerrville Folk Finalist Hennebach can be heard on her two albums. Her self- titled debut album was hailed by CMJ as "an engaging collection of folk infused with pop smarts," with songs ranging from driving Celtic tunes to quirky love songs to ballads based on her work as a music therapist, and led many to compare her with Kate Bush and Joni Mitchell. On her second album, "Michaelean", she navigates the mysterious boundaries between real life and the countless supposed realities we create for ourselves, an obsession Hennebach attributes to being adopted: "Growing up adopted can be very liberating. Not knowing where I came from, for example, freed me from thinking I had to be exactly like my parents. I was from 'some other place,' so it didn't matter that I couldn't explain my Celtic bent or my love for the piano. What mattered was that my family supported my dream to communicate through words and music. After writing Michaelean, a song I wrote for my adopted sister about what I imagined her roots might be, I followed a paper trail to my own birth mother. Sadly, I learned that she had passed away in 1981, but she left personal journals, poems, letters and music that reveal her life in vivid detail. I feel lucky that I'm able to remember this woman I never knew, and that I've found my second family. Being adopted has opened me up to feelings of connectedness with many people, family and nonfamily. Performing music across the country enables me to experience this first hand.'" Having performed since the age of seven, she's had ample time to master the guitar as well as the piano, her first instrument. Playing everything from Bach to Prokofiev, she won numerous statewide piano performance competitions before graduating from Overlin Conservatory, Ohio, and then earning a master's degree in music therapy from the Guildhall School of Music and Drama in London. It was in the London Underground, however, that Margo developed the distinctive voice that continues to attract a loyal following. Her live performance, with guitarist/husband Mark Saunders, is what audiences remember and take with them long after the last note is heard. "I could probably sing it better than I could explain it, but by playing music, I put myself in the middle of the 'shivering,' a place in between knowing and the not knowing, in between the limitations and the endless possibilities. I have a song called 'Mercy" that explores that tension: 'Mercy me, oh mercy me, if this is what I've got/Make me more of who I am and less of what I'm not/Deliver me from evil and out of danger's lair/Mercy, you have found me/I'd know you anywhere.'" In the U.S. Margo and Mark tour the country, headlining many of the nation's top folk venues. Margo was also a member of the female trio Madwoman in the Attic, voted Best Acoustic Act by Hartford Advocate readers in 1995 and 1996, and known for harmonies so tight you can't fit a piece of paper between them. 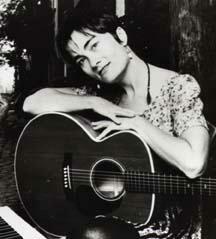 Margo has performed at numerous festivals, including the Philadelphia Folk Festival and the Bethlehem Musikfest. She has also appeared at Fast Folk Shows at The Bottom Line, supporting John Gorka, Shawn Colvin and other favorites on keyboards and harmony vocals.